The Fire (Scotland) Act (2005) requires that employers ensure, as far as is reasonably practical, the safety of all employees against the harm caused by fire in the workplace. Fire remains a major cause of damage, physical harm and fatalities in the workplace. Public buildings and places where groups of people meet are especially at risk. The main requirement of the Fire (Scotland) Act is for duty holders (in this case, the charity trustees of the congregation) to undertake a fisafety risk assessment (FSRA) and consider a number of prescribed firesafety measures to protect employees and anyone else using the building. The Fire (Scotland) Act is supported by the Fire Safety (Scotland) Regulations 2006 (FSSR), which provide further information and guidance on prescribed fi e safety measures and fi e safety management. Please note: The fire safety advice provided in this section of the toolkit is general advice and covers the legal requirements of the FRA and FSSR. However, all congregational buildings are different and it would be impossible to provide guidance to fit all circumstances. A degree of judgement is required and it is strongly advised to seek specialist advice when unsure of how to proceed with fire safety arrangements or when it might be difficult or impractical to apply the requirements described within the toolkit to particular properties. This is especially important when buildings of historical importance are concerned. The Church of Scotland General Trustees and the Church of Scotland Insurance Service (COSIS) will be able to offer additional advice and support and you are strongly advised to contact them in the first instance. The charity trustees and other members of the congregation are best placed to carry out a FSRA, as they know their buildings best. The procedure for carrying out a FSRA is described in the following section and a small group of volunteers should be tasked with undertaking this – however, it is the responsibility of all charity trustees to ensure that the outcomes from the FSRA are implemented. If the charity trustees do not feel that they are comfortable, confident or competent to carry out a FSRA, please contact the Church of Scotland General Trustees or the COSIS for further advice and guidance. The FSRA is an essential element in the overall health and safety policy of any premises. The FSRA should be specific to the fire safety arrangements in the premises to which it applies. A general risk assessment, as described in section 2 of this toolkit, is not appropriate when considering fire hazards and risk. Congregational properties are generally considered to be low risk in terms of fire safety. However, this depends on building location, structure, fabric, activities undertaken and those who might be at risk. The FSRA is an organised and methodical look at buildings and the activities taking place within buildings so that the likelihood of fire can be established and the harm that it could cause to the people in and around buildings can be assessed. If fire safety measures are already in place, such as fire alarms or fire extinguishers, these are reviewed during the FSRA to establish if they are still appropriate or if more action is required. To carry out a suitable and sufficient FSRA, it is important to consider each of the following fipoints as described within the Scottish Government’s fi e safety guidance booklet (ISBN 0-7559-4965-X), available free from www.gov.scot. Please refer to Part 3.7 of this toolkit for advice on who should carry out the FSRA for properties. There is no prescribed template in the legislation for a FSRA. However, a template has been included in the template section of the toolkit. Describe who works in or uses your properties (inside and outside), including visitors and contractors, and how often they use the buildings. It is also necessary to consider and document in a FSRA the age range of users (including the very young, children and the elderly), the maximum number of people who can safely use buildings at any one time, and those with disabilities. For a fire to start, there has to be a source of ignition, fuel and oxygen. If one of these components is missing, a fire cannot start. It is important to stop these three components from coming together to prevent a fire from starting. The main source of oxygen within properties is from open windows and doors. However, any structural defects might also be a significant source of oxygen. Some chemicals are oxidising and may provide additional sources of oxygen if used or stored incorrectly. The chances of a fire starting will be low if there are few ignition sources. However, properties should be critically examined to identify any potential accidents, acts or omissions which might allow a fire to start (please see sections 2 and 5 of the toolkit). It is important to consider the likelihood of deliberate fire raising as part of this evaluation. Following identification of fire hazards in step 2, the risks should be avoided by removing or reducing sources of ignition, fuel and oxygen. If hazards cannot be removed, measures should be taken to reduce the risks. Fire safety measures should be put in place to reduce the likelihood of fire and the spread of fire, to provide means of escape, to fight fire, to detect fire and give warning, to arrange for action in the event of fire and for training. Once the FSRA has been carried out, the findings must be recorded, including any action taken or to be taken in future. The record must be kept on the property and all employees and other relevant people such as volunteers must be made aware of its contents. The fire service may also wish to see a copy of the record if they visit a property. 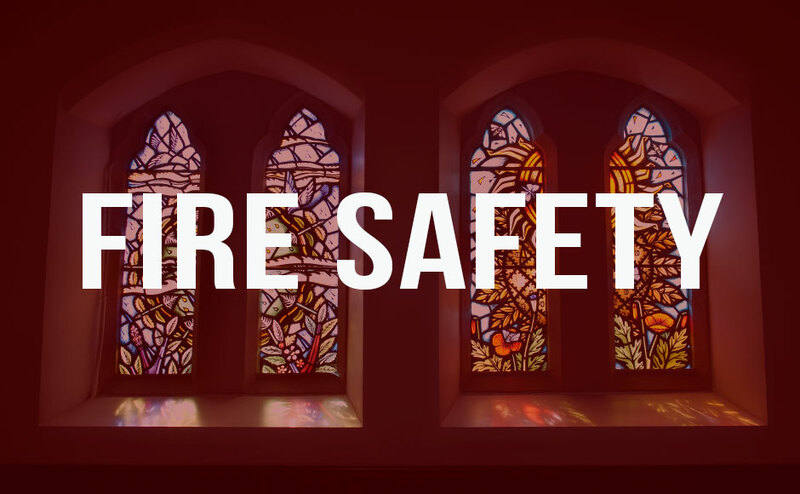 Although the Fire (Scotland) Act requires that a record is kept if five or more employees are employed, the Church of Scotland requires that all congregations keep a record of their FSRA and any further action taken to control the risks of fire. Becoming aware of shortcomings in fire safety measures or potential improvements. The Financial Board must ensure that there is a clearly defined fire safety policy for the protection of everyone who uses church properties, including staff, volunteers and visitors. The fire safety policy is similar to the health and safety policy and should include arrangements for planning, organising, controlling, monitoring and reviewing the fire safety measures taken. The Financial Board must ensure that there is a written emergency fire action plan in place that sets out the action that must be taken by staff and volunteers in the event of a fire, and to ensure the safe evacuation of properties. It is important that consideration is given to how staff, volunteers and visitors with disabilities will be helped from properties and also how to evacuate safely any children or young people. For example, during worship, duty elders could be asked to take responsibility for the safe evacuation of a property in case of emergency. All staff (including stewards, volunteers, performers, visiting contractors and temporary and agency staff) and other relevant persons should be given information, training and instruction on the fire safety measures to be taken or observed on the premises, including the action to be taken in case of fire. The specific fire safety training needs of any young persons employed should be considered. Training of each member of staff should take place as soon as possible after they are appointed and regularly at predetermined intervals after that, to ensure that they remain familiar with procedures. Information should be given to staff and other relevant persons whenever there is a change in the risk from fire, where changes have been made to the emergency fire action plan or other fire safety measures, or where working practices or people’s responsibilities have changed. In all premises, including those not usually staffed or those used on a relatively infrequent basis, emergency routes and exits, firefighting equipment, fire alarms, emergency lighting, fire and rescue service facilities and other fire safety measures should be kept in efficient working order and be covered by a suitable system of maintenance. Regular checks, periodic servicing and maintenance should take place and any defects put right as quickly as possible. Each day that a property is used, a general walk through should take place to ensure that escape routes are clear from obstructions and that any fire detection system is working. All emergency escape doors must be operational and any emergency lighting working. If a fire alarm system is in place, this should be tested at least on a weekly basis. If alternative methods of alerting property users of the presence of fire are used, these should also be tested weekly. All other fire safety measures, including fire extinguishers, should be checked on a monthly basis to ensure that they are in the correct location and operational. Much confusion surrounds whether congregational properties require a full smoke detection and fire alarm system. Fire safety legislation states that there must be a means of alerting property users in the event of a fire. In small properties, a small, hand-operated sounder or a verbal instruction might be sufficient. In larger, more complex properties, a manual or automatic integrated fire system may be required. No specific guidance exists to determine which system is to be used in which situation and it is important that the FSRA evaluates all potential fire safety risks to assist the Financial Board in deciding which is best. Fire safety legislation states that firefighting equipment must be provided where necessary. Again, the FSRA will assist the Financial Board in their decision making as to whether to provide firefighting equipment. However, it is important to note that any firefighting equipment provided and in place within congregational properties is likely to be used by the fire service when there is a small fire and therefore can be beneficial in protecting the building from extensive damage from fire. Further advice and information regarding the provision of automatic fire detection and firefighting equipment within congregational properties can be obtained from either the Church of Scotland General Trustees or the COSIS.